I have att uverse 12meg service, I have been having slow internet connections for the last week since they had a service interuption of some sort. I have gone the rounds with their tek guys trying to figure out why I am only getting an average of 3 meg download service. 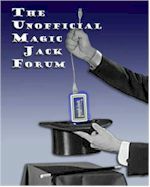 the tek guy tells me today that magicjack is eating up all of my bandwith and to disconnect it while surfing the web and plug it in when I want to use the phone. this guy is a joke. any comments? I've had MJ for years now, and it's never slowed now my internet! Gee, since MJ consumes 80kbps in each direction while engaged in a phone call and virtually no bandwidth while idle, it would be quite a feat for the MJ to be the cause of your distress.